Class-III ADH is remarkably ineffective in oxidizing ethanol, but it readily catalyzes the oxidation of long-chain primary alcohols and the oxidation of S-(hydroxymethyl) glutathione. 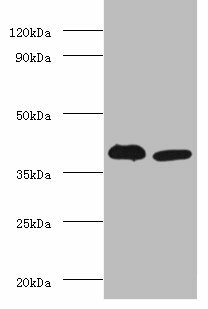 Adh5 Polyclonal Antibody. Unconjugated. Raised in: Rabbit.